Steph's Endurance: Horse feet - I'm the boss! Horse feet - I'm the boss! Well, I'm ten weeks into the 'no shoes' thing - and I may be at the point of 'no going back' now. I'm pretty much convinced that it's the best thing for my horses. I still have worries and concerns... not so much about whether or not a horse can be sound and functional in endurance without steel shoes - this I believe is totally possible. But more about managing the transition period - and if I'm going to have issues with boots, no boots, etc. while keeping up my ride schedule. I've had fantastic experiences with the glue-on boots during a ride, I've never felt my horse move so freely and lightly. But with the current process of glueing, then removing (which is a bit of a hassle and also an expense) I don't think I'll want to glue on boots for every 50 mile ride that I do. Multidays, yes - or 100's, yes - but not for just a 50. So that leaves me needing to ride in boots since the horses feet aren't tough enough to go without some protection at this point. Jaziret's feet are just in between sizes - #2's are too tight in the heel bulbs, #2.5's are too long in the toe. I think I'll end up taping his feet and using the 2.5's for the next ride (April 3, Tough Sucker!) - but I've seen them twist on him, and we'll have river stops, sand, rocks... we'll see! 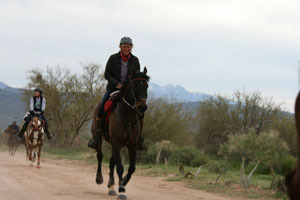 I've been doing the trimming myself on the horses that are here with us in Arizona - and I think I can keep it up and not have to depend on somebody else, and periodic appointments, at least for some of the riding horses. I actually enjoy it - and it's very empowering to be able to do it myself, at any time. Just a little rasping, some cleaning up of the frog and sulcus, a little whittling on the bars- every other day or so. It's not as strenuous when done a little bit at a time, and I LOVE the fact that the horse doesn't have to go 6 weeks or so between trims. I can keep the foot balanced all the time. I'm not positive that I'm doing everything right, but the more I listen and watch and learn, and the more I practice with the tools, the more confident I feel. I went to a fantastic clinic yesterday by Dr Tomas Teskey. 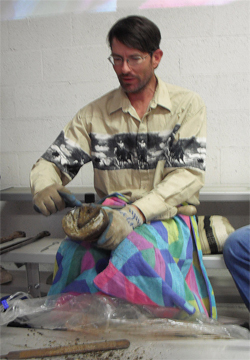 He's a veterinarian, now living and working at the family ranch in Hereford Arizona. A fascinating individual - soft spoken, yet very passionate. He's been promoting the 'barefoot' horse for several years (almost a decade I think(, and has become an expert in the field of hoof function, and health and soundness. The morning was spent with him presenting slides and pictures. He explained the basics of the horse hoof - anatomy and functional mechanics and physiology - and he described the damage that can be done to the hoof structures over time by the constant application of steel shoes, or lack of care (inadequate or improper trims), or constant stall confinement - most of which boiil down to an inhibition or absence of natural expansion and contraction and weight loading mechanisms of the hoof. He also addressed the need for a holistic management approach - diet, exercise, hygiene. He continually stressed the importance of exercise and movement - critical to the development and maintenance of a healthy hoof. 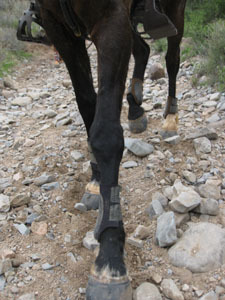 He showed several examples of healthy hooves in different environments - and the differences one would see in rocky or sandy terrain, or soft grass terrain, or wet, or dry, etc. - differences in how the hoof adapts to the different environments - thickness of sole, length of wall, density of hoof wall, etc. After lunch he gave us an amazing lesson in hoof anatomy with the dissection of the foot of a 2 yr old thoroughbred horse (cadaver). The foot was well formed and in good shape. He showed us some trimming techniques - what to look for, how to deal with the various surface parts - sole, wall, frog, bars, sulcus. He then took the foot apart bit by bit - peeling the sole away from the corium so we could see what it looks like on the other side - very cool to see the sole/frog interface from above and below. He then exposed the coffin bone - and showed where the bone ends, and the cartilage begins as it forms the arc of the foot. As the horse's heel strikes the ground the force is absorbed through the cartilage, the digital cushion, the laminar suspension, and even the 'hydraulics' of the massive network of blood vessels that perfuse the lamina. He showed us how the navicular bone fits into the curve of the coffin bone - the location of major blood vessels in this junction, and the hazards of contracted heels in a horse, with the resulting constriction of blood flow. Very graphic. I do love this stuff! The clinic moved to the barn where he did some evaluations on horses - it was interesting - but the horses we looked at had been barefoot for several years already. So we were able to see good healthy feet, but I would have been more interested in seeing transitional horses, or problems to solve, at least at this point in my 'education'. I think the thing that impressed me the most about Dr. Teskey was his very simple, natural approach to managing the horse's hoof. He is a strong proponent of letting the horse 'do it's own trimming'. Give the horse a natural environment, a regular exercise or movement regime, and the hoof will respond optimally over time. He has also observed that some methods of trimming can cause damage, and inhibit the formation of healthy hoof material. Excessive carving of sole is one of the things he warns against - basically don't touch the sole - let it exfoliate naturally. Roll the walls to prevent chipping, don't leave long walls or heels, but some extension of hoof wall is ok especially in softer terrain. It's important for the frog and sole to also bear weight. He did encourage keeping the frog healthy by trimming away flaps or thrush infected areas. He cautioned against using caustic products, that can kill live tissue as well as anaerobic organisms, but feels it is very important to keep the junctures free of thrush. This is definitely a new 'journey' for me! I'm enjoying the learning curve, and very encouraged by observing success stories, and seeing some beautiful feet on hard performing horses. It's nice to have more choices in hoof protection on the market now - so that people like me can transition to a barefoot horse, but still keep riding and competing. As long as I can keep the horse comfortable, and working, I'm willing to keep up the management efforts. It will be interesting to see how it goes when I get the horses back to Idaho. The terrain will be different from the hard granitic soil surface here. Softer dirt, more really rocky areas, daily creek crossings. I'm also looking forward to working with all the other horses! Some have been barefoot during the winter, some shod. A couple of them have been turned out (w/o shoes, but also w/o a focused trimming regime) because of minor foot (I suspect) related lameness.